Dive N' Surf, another South Bay watersports landmark, has been around for six decades and is considered one of the region’s premier dive facilities. 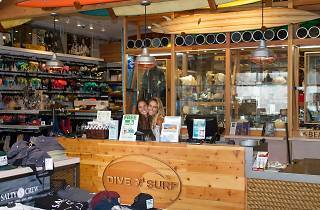 Dive N' Surf was first co-owned by diver Bev Morgan and legendary South Bay shaper Hap Jacobs before being sold to brothers Bill and Bob Meistrell, midwest transplants who graduated from El Segundo High School and were two of the first LA County lifeguards. The Meistrell brothers would go on to found Body Glove and become wetsuit pioneers. Today their legacy lives on in and out of the water—the modern wetsuits they had a hand developing hang proudly in the store, lined by a large selection of surf apparel, surf gear and dive equipment. 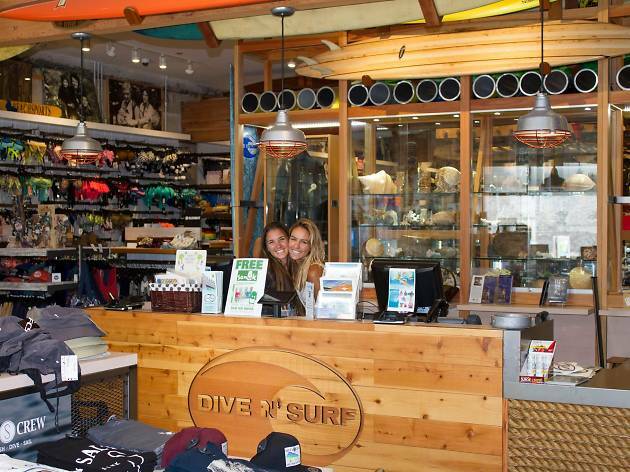 Their selection of surfboards is smaller compared to nearby competitors, but Dive N' Surf makes up for it in the amount of dive gear they carry. They also offer SCUBA courses and are famous for their annual yard sale, a typically month-long event held in late winter with deeply discounted items for sale.